Atkinson-Baker | Do Work and Life Ever Balance? 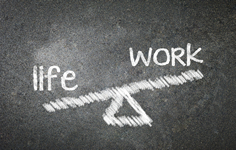 Do Work and Life Ever Balance? Many of us lawyers are Type A, competitive perfectionists, and these traits don’t fade away when we become mothers. While our aggressive natures can serve our clients well, I question how well they sometimes serve us. Recently, a good friend of mine who is also an attorney asked me how I “do it all.” I was flabbergasted. Doing it all? Could I possibly give others the impression that I am succeeding at everything? To my mind, being a practicing attorney, mother of two under two, and wife has resulted in me being perpetually late with damp hair and yesterday’s eye makeup. I’m lucky if I get to work with my briefcase instead of my diaper bag, and I often have to go home after a few hours because I forgot some crucial part of my breast pump. My billings aren’t as high as they could be, and I look at my phone way too much when I should be playing with my toddler. I ate Triscuits for lunch yesterday. Is this having it all? In an attempt to give myself a little more credit, I tried to imagine her perspective. She sees a successful, full-time young associate. She sees a mother of two adorable little girls who are generally clothed and in clean diapers. She sees a wife in a happy, content marriage. She sees a friend who manages to help host bachelorette parties and baby showers and even the rare girls’ night out. She sees a woman who never leaves the house without mascara and lip gloss. That all seems encouraging. But to me, much of that is a façade. What my friend doesn’t see is the proverbial dirt under my rugs. She doesn’t know the stress I feel when too many things happen at once or the blame I place on myself when I don’t believe I’m doing as well as I should in all sectors. Instead of feeling flattered that my friend thinks I’ve got life figured out, I felt concerned. Some day, will she be standing in the kitchen in a barfed-upon business suit trying to comfort a sick kid, burst into tears over a burned dinner, and think to herself, “Why can’t I do it all like Stephanie?” I could not stand to be part of that illusion. I’m fortunate to participate in a networking group for mother attorneys, MAMAs Austin. At a recent panel a speake (who was a mother and also the managing partner of a large firm) said “What the heck is work life balance anyway? There’s no such thing as balance. And that’s ok.” It was refreshing, this notion that feeling like I’m always a day late and a dollar short might just be… fine. Maybe all working mother attorneys need to admit that—short of picking up a drug habit that makes sleep unnecessary—we will never, ever bill 200 hours a month while planning Pinterest-worthy children’s birthday parties and folding the laundry before it gets wrinkly. So the dogs’ vaccinations happened a few weeks late this year, and the baby just spent a full 24 hours in pajamas, and that romantic anniversary trip hasn’t happened yet. So what? What impossible standards are we holding ourselves to if we quietly feel like failures when our closets aren’t perfectly organized and our nails aren’t perfectly manicured, on top of all the big stuff? And to all the working moms out there who think you’re just not doing well enough: You are. You really are. Don’t think you will reach a magical moment when your work and home to-do lists are completed and every day leading up to that impossible moment is a failure. Don’t expect your work and life to ever perfectly balance. Because it’s all work, even the life parts. And it’s all life, even the work parts. As working mothers, it is our job to simply ride the wave. Hire a maid if you can. Talk to your boss about going part-time if you need to. Press mute on that conference call if your kid is screaming in the background. Put a jacket over that mystery stain on your blouse. If your family feels loved all of the time and your clients or bosses are happy with your work almost all of the time, then you are a success. An unequivocal, enormous, smashing success. And you deserve to credit yourself for that immense success. … even if your toddler ate Goldfish for dinner last night. Stephanie Potter is an associate with Naman, Howell, Smith and Lee in Austin Texas. She joined the firm in 2009 and hHer practice focuses on civil litigation and administrative law. © 2013 Ms.JD. This article was originally posted on Ms.JD.